7 targets, 6 catches, 120-130 yards allowed. Peterson started slow, but was pretty good for the most part. Made a great play on the ball in the endzone he does struggle with double moves a bit and does not like changing direction more than once on a play this is the best way to attack him. The big play to Amendola in the first quarter likely would have been a sack had Daryl Washington not slipped as he blitzed though the line. There was another play where an accurately thrown ball probably ends in a 20 odd yard completion for the Rams. Darnell was invisible. Did nothing in the passing game, we might have been better off leaving him inactive this game giving him even longer to get over his hamstring injury. By that same token Campbell was pretty quiet too. Had a couple of good plays rushing the passer and batted a pass down, but we need these two guys to give us more than they have over the past two games. Sam Acho had a pretty quiet game, but Schofield more than made up for it. Acho was close to a couple of hurries to go with his hit, but Schofield won his battle with Richardson more than a few times and drew a holding call in addition to the pressure he created. Daryl Washington may be the best blitzing linebacker in the NFL. I have not seen enough of others to make that call, but it seems he is very, very efficient when he does come on the blitz. The team needs to either refine their cover three or refine it. We have been burned using that playcall more than once in this game. I might get into this a bit more, my note on the 51 yard TD pass. Big TD pass to Givens was Cover Three. Deep safety taken to the middle of the field by a receiver running a deep cross. Both outside receivers run a 9 or fly route 1 v 1 with the CB's. All four of the underneath zone defenders are essentially useless. Only one leak out short option here. 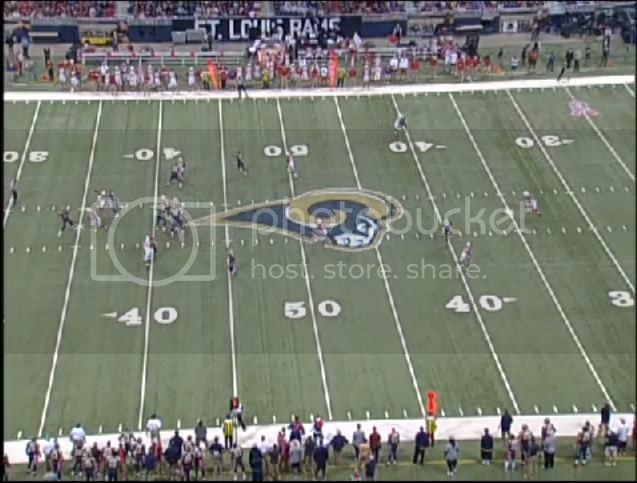 Very nice playcall from the Rams designed to put a lot of stress on the top of the defense. Cardinals needed to do a better job of applying pressure here. A lot of this game was poor throwing rather than good coverage. The Rams could have had a few more solid chunks of yardage on balls thrown more accurately. Bradford was not all that impressive in this game, but he hit the big plays and the Rams got the job done. Darnell probably shouldn't have played in hindsight. Calais should have played much, much better. One of the weakest OLs we'll face all year and we got nothing from the ends. Tough to swallow. Good stuff. It looked like PP had no safety help over the top on that beauty catch by Amendola. That was odd. Anyhow teams will continue to attack Toler. Gay needs another chance. Not odd. They generally roll coverage away from Peterson and leave him on an island. You did this all by your self? just too much work and time consuming. beauty. The best CB in that game for me was Bradley. me with this Rams D. Fitz never really goes off vs us. i had James as the second best lb in the division. I now have no problem saying Washington just moved ahead. I know they do. They have done that for close to a full season counting last year. They usually don't do it 40 yards down the field. Kerry Rhodes was invisible. I honestly didn't even see him all game. While I agree PP didn't have his best game. Bradley had a pass rush and that doesn't mean he was the best CB in the game. If Kolb had time he would have picked him apart. We simply have the scheme that holds him. There were two or three times where Fitz was running free in the secondary which could have been big plays for him, but Kolb either did not see him (1st drive) or was on his back within two seconds of the snap (about three other times in the game). If Kolb has any time on any of those throws Fitz probably had another 60-80 yards and a TD. Also - The play Amedola was injured on had William Gay in coverage not Peterson, so if he hauls that in it is Gay not Peterson. There was a play later on (Cannot remember the exact time) where Peterson was trailing Amendola on a double move and Bradford could not hit him with an accurate throw. It is Cover One - The single deep high safety is shaded to the other side of the field. You can see that was a good choice and Toler has been beaten on the route. At the point of the throw Peterson has very good coverage at the top of the screen, the issue with this play is that he never got his head around and made a play on the ball. This was a very good chance to be an interception, and if he does turn his head and make a play there is a good chance they never throw the PI flag. We blitzed 6 and Washington very nearly got there through a clean lane, he only missed because of a slip. You can see Bradford tosses this one up off his back foot (He had no other choice) this is a similar throw to the one Peterson did pick off in the endzone. Thanks for that. Nice to see it in slow or freeze frame. PP actually has good coverage there. There was at least two plays where Fitz had beaten his guy, I want to say it was JJ, and Kolb just couldn't connect because of the pass rush. If we're talking missed plays, we need to mention the should-have-been 55 yard touchdown, where Roberts beat Jenkins down the field and was wide open, only to have Kolb miss him. Fletcher is a beast, only second to Chris Culliver .